Water technology company A. O. Smith Corporation (NYSE-AOS) announced that it has acquired Water-Right, Inc., a Wisconsin-based water treatment company, for $107 million in cash, subject to customary adjustments. The acquisition includes all Water-Right subsidiaries, real estate, and sister company Mineral-Right, Inc.
A. O. Smith celebrated the grand opening of its new Lloyd R. Smith Corporate Technology Center. The 42,700-square-foot research and development lab, located adjacent to the company’s world headquarters in Milwaukee, will serve as the company’s global innovation hub. Everybody loves a hot shower. We all appreciate the convenience of clean clothes and dishes. And what can be more enjoyable than a relaxing dip in a hot tub or whirlpool? There's nothing like hot water, and one company has been delivering the world's hot water for more than 80 years...A. O. Smith. But today's A. O. Smith is about more than hot water. We recently entered the water treatment industry to deliver clean water to consumers in China and other fast-growing parts of the world. 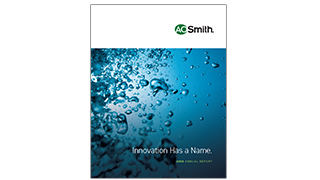 It's all about water, and A. O. Smith has a singular focus on becoming a global leader in water technology. 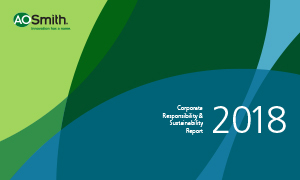 A. O. Smith Corporation (NYSE:AOS) will release its first quarter 2019 financial results before the market opens on Tuesday, April 30 and has scheduled an investor conference call to follow at 10:00 a.m. (Eastern Daylight Time).